The mere mention of the word strikes fear into the heart of homeowners everywhere and with good reason. A more destructive and organized pest was never battled by exterminators. Eating constantly; 24 hours a day, 7 days a week…no vacation, no sick days… just consume, consume, consume. 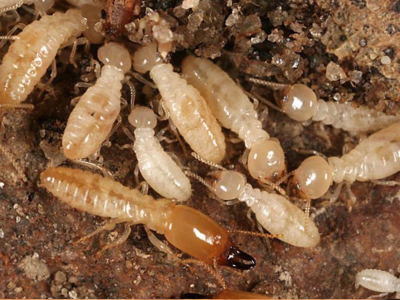 This has made the dreaded subterranean termite an enemy more destructive than any other insect! But lucky for you there has never been a better time to have termites. New treatments, new techniques and new tools are now available to ensure virtually 100% success on the elimination and protection of your property from these destructive pests. And better yet, Eco Elite Pest Control has them all!! Contact us for information on scheduling FREE inspections, estimates and advice for Termite Control! In a hurry? Selling your home and you need quick Termite service? Contact us by Phone, Text or Email and Answer a few quick questions and an estimate can be on its way in minutes. Eco Elite Pest Control is fully licensed to perform both Termite Inspection and Treatments. Our Warranties and Pricing are second to none. But rest assured, nobody but nobody will take better care of your home and property than Eco Elite Pest Control in Kansas City and we back that up with a comprehensive warranty, follow-up inspections and a caring, responsive termite team, second to none. Try us and you will agree.